This is a completely customized Chief Petty Officer Military wedding cake topper ordered by one of our customers. 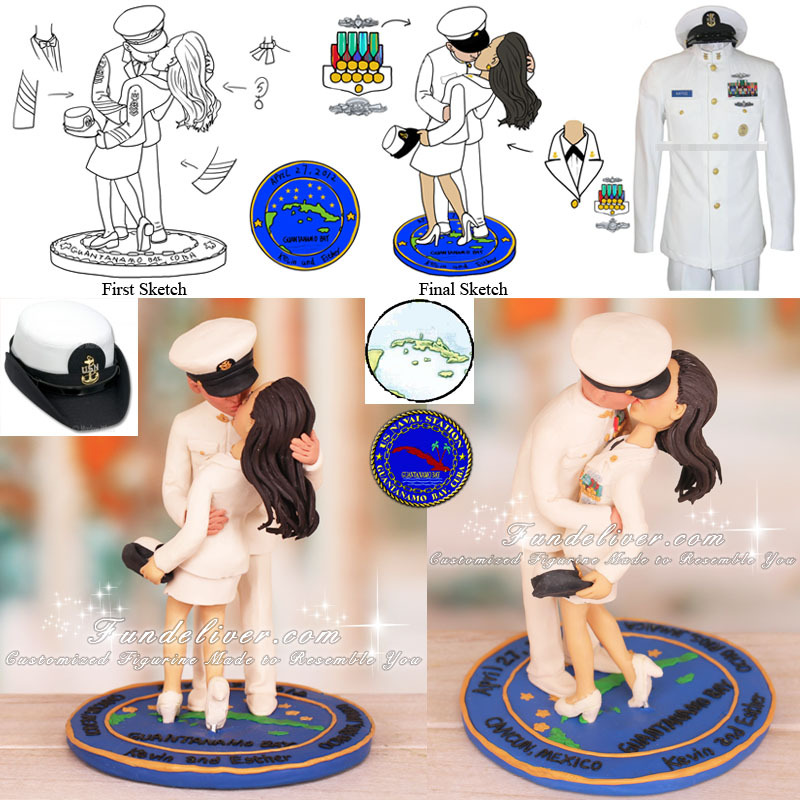 They are both military and love their wedding topper to be similar to this Kissing Navy Chief and Nurse Cake Topper. The groom is a Senior Chief (19 years) in the Navy and the bride is a Chief (15 years). They would love the same pose with the exception of the female being in a CPO (Chief Petty Officer) uniform as well, but instead of pants...a white skirt and a female CPO cover in the lowered arm. They would like the groom to be in his white Dinner Dress uniform, which is similar to the CPO uniform but with different bow tie and gold buttons. They would like to put “Guantanamo Bay, Cuba” on the base since that is where they met. Also they want to put a partial map that includes Cuba, Jamaica and the Yucatan peninsula in the center. Because they met in Cuba, their 1st trip together was Jamaica and they are getting married in Cancun, Mexico...the Caribbean area plays a big part of their relationship.